Greey|Pickett is a professional firm comprised of landscape architects, urban planners, artist and talented production staff. Greey|Pickett was formed in 1997 by Russell Greey and Wendell Pickett. A true collaborator who enjoys listening as much as creating, Russ Greey has over 30 years of national and international experience designing world class landscape architectural projects for clients across the globe. He approaches any project, large or small, by gathering insight from clients and inspiration from nature to bring outstanding land designs to life. For Russ, landscape architecture is not just a business – it’s an opportunity to do what he loves best: bring top-notch expertise to clients, forge a collaborative working relationship and provide outstanding design solutions. We at Greey|Pickett are resourceful problem-solvers operating at lofty levels. After all, our clients have much at stake and face tremendous risk; almost every stage of our work is considered a crucial juncture and mistakes aren’t in the business plan. Today, we have nearly 20 employees. All of which are “thinkers” first, with an established track record supported by dozens of successful featured projects created over decades. Each project is an experience that solves unique problems, provides specific solutions and pushes the boundaries of the typical expectations from planners and landscape architects. Unlike some of our colleagues, Greey|Pickett survived the economic downturn and came out a smarter, more unified, thriving organization. When you work with Greey|Pickett you can rest assured that you are also being teamed up with the most knowledgeable and well-respected subcontractors in the business. Our long-standing relationships with experts in their field provide a collaborative effort with the leading landscape maintenance companies and interior plant solutions putting Greey|Pickett above the rest. Greey|Pickett projects are based on sustainable landscape practices, from drought tolerant energy efficient directives. We implement LEED Green Guidelines for Sustainable Landscapes as a basis for all of our designs. We believe we are stewards of the land and our practices embrace this philosophy. With a reputation for excellence and a network of top rated suppliers, Patterson Homes LLC has been able to offer high end quality service at some of the most competitive prices in the industry. Creating the perfect frame for your home and lifestyle is our focus. Beautiful landscaping Phoenix and Scottsdale area homeowners love involves sound planning and skilled craftsmanship to bring to life. Your dreams, needs and budget are important. We ensure that every Scottsdale and Phoenix landscape design we create fits both your desires and your property too. Your yard is an extension of your home. As professionals with years of experience in all aspects of Phoenix and Scottsdale landscaping, we respect that and provide you with exceptional customer service and top quality work from design to completion. You'll find it a fast and easy process working with one reliable contractor too. Our General Contractors License allows us to do every step of your project, be it simple or complex. Whether you are in the market for professional landscaping services or looking for routine maintenance, Greenwise is at your service. We handle everything from landscape design to any lawn repairs. We are dedicated to our Client's inspiration and the creation of unique exterior spaces. Our design solutions incorporate clean lines, simple patterns, and natural materials that compliment both architecture and environment. BLACKHAūS Design, LLC is owned and operated by Rck Schwarz and is a Site Design and Landscape Architecture firm in Phoenix, Arizona (not a Contractor). We specialize in residential and commercial site design, resort planning, technical drafting / detailing, plan view graphics, and installation management. Our professional commitment centers on the long-term viability and sustainability of our design solutions. Personal integrity, tireless work ethic, and demonstrated Client service reinforces our pledge to quality Site Design and Landscape Architecture services. Rick Schwarz (Owner and Primary Designer): Graduating from ASU with a Bachelor of Science degree in Landscape Architecture and a minor degree in Urban Planning, Rick has continued his design exposure with post-graduate courses and field studies on urban plaza design and environmental remediation in Germany, Italy, and the Netherlands. Rick's extensive project experience includes working for four years under the design direction of notable industry leaders Christine Ten Eyck and Kristina Floor, followed by an eight year senior design associate position at Greey | Pickett. From 2010 to 2013, Rick was a managing partner at Suite Design Group before launching BLACKHAūS Design, LLC. Rick’s professional experience reflects a history of conducting task-explicit, creatively conceived, and detail-oriented stewardship of projects throughout the United States. (Arizona, California, Nevada, Washington, Virginia, Florida). One company blending innovative landscapes with resort-style, luxury pools. Unique Companies specialize in all aspects of landscaping, pool construction and swimming pool remodeling. Unique Companies build everything from swimming pools to complete backyard environments, allowing you to enjoy ‘Outdoor Living’ in Arizona to the fullest! 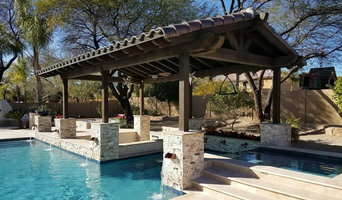 Our experienced, friendly and talented pool designers and staff are well-versed in all facets of Arizona landscaping, new pool construction, custom spas, outdoor kitchens, ramadas & pergolas, fireplaces & stone travertine patios and pavers installation. We take pride in designing beautiful and functional swimming pools & landscape environments to fit your needs. Unique Companies continues to rank among the top landscape companies in the Phoenix area. Rocket Garden Landscape Design specializes in creating one-of-a-kind, water-conscious landscape designs featuring native and desert-adapted plants for homeowners and HOAs in the Phoenix area. From detailed, scale landscape plans for major renovations and installs to consultations with written recommendations and sketches for do-it-yourself projects, we can help you Launch Your Landscape! After discovering a passion for the desert's unique plant palette, Principal Designer Erin Hutton left a 16-year engineering career and completed the Desert Botanical Garden’s Desert Landscaper School Certification Program in 2009. Today, she teaches classes and provides training for the design certificate program at the Garden, speaks at conferences, and serves as President-Elect of the Association of Professional Landscape Designers, Arizona Chapter. Giardinello Landscape & Design believes that the first step in a successful Landscape Design journey should be to select a reputable partner that provides full project services, excellent customer service, and incredible quality and craftsmanship – all at a low total cost. That is why we offer the following: ~ Creative Garden Designs - We create detailed designs using landscape design software. Our clients love our unique approach for designing custom gardens. Giardinello takes the time upfront to explore your needs with our exclusive Design Questionnaire & Complimentary Design Consultation. We then begin to form a custom hardscape and landscape design around your lifestyle and budget. Included in the design is a comprehensive estimate of all materials & labor as well as their associated costs. ~ Full Project Installation & Management – Giardinello orchestrates the entire project including all of the tasks and individuals involved in building a superior landscape space. Exteriors by Chad Robert, Inc. specializes in residential and commercial landscape design and construction. Our clients are an integral part of the design process and because of their input, our gardens have become reflections of their personalities as well as an extension of their living environments. We also focus on providing sustainable economical landscaping that enhances the buildings it surrounds. We are licensed landscape architects and are fully bonded, insured, and licensed landscape contractors. 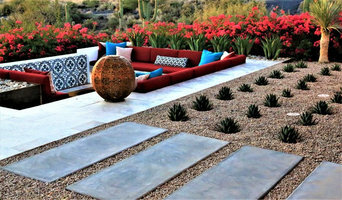 Based in the Arts district of Phoenix, Arizona, our designers work with Arizona's leading architects, interiors designers and general contractors to create unique gardens throughout the Phoenix metropolitan area. Our projects include native Sonoran garden settings in Paradise Valley, Scottsdale, Carefree, and Cave Creek in addition to numerous lush, green gardens in such exclusive Phoenix neighborhoods as Arcadia, the Biltmore, and Encanto districts. Each year Exteriors' landscape designs win numerous awards, and our projects have been published in local newspapers and national magazines as well as featured on the Home and Garden Channel. Let our team of innovative professionals help you create a unique garden oasis in the desert. A design build firm, specializing in remodel and makeovers for 20 years. Nanette Injeski, landscape designer, is CEO of Nanette Injeski Land Design, LLC. Nanette brings a unique approach to landscapes in the desert, pushing the envelope using site architecture to compliment rare and colorful plants. The natural environment, surrounding architecture and seasonal interest are key factors in her approach to design. Nanette specializes in complete landscape design and planning working closely with the clients budgetary requests. Impeccable landscape installations are also offered to the client. Desert Foothills Landscape has become synonymous with large scale, awe inspiring, high desert landscapes. We have had the honor of creating beautiful unique surroundings for private residences and museums alike. We have won awards, graced magazine pages, and appeared on television, but ultimately, we just love what we do. We have literally moved mountains, boulder by boulder, to make dreams come true. We are just that passionate about exceeding our clients' expectations! Since our inception in 1990, we have honed an innovative artistic approach to creating outdoor living environments that will significantly increase the value of your property, and more importantly, the quality of your life. We create the art you live within. We view landscape as an interaction, multidimensional, living art form. It should be unique, stimulating setting that engages the senses, sparks your imagination, and renews your spirit. Your landscape should have a timeless beauty that allows you to transcend the day-to-day, and greatly enhance your quality of life. We want you to awake in the morning with a desire to race outside to your own personal oasis. Over the years, we have fine-tuned our artistic approach to landscape design and installation. Our techniques are based on decades of successful installations that began small and grew over time to an impressive “WOW FACTOR” scale. We have built up an extensive palette to work with and we are able to pull from it on site to create vignettes as we go. In the beginning stages, we walk you through a clear plan of the elevations in the yard and the placement of the focal vignettes that will create the flow through your landscape journey. We are passionate about design. On every project we strive to create an environment that engages, inspires and lasts. We look at the natural aesthetics, understand the context, and collaborate with the Client and all who are involved to shape the vision of the project. Through this holistic approach, Client’s soon realize that our interactive, honest and efficient approach to the design process creates a “sense of place” that embodies the Client’s vision and natural aesthetic within the architectural context of the surrounding environment. Our goal at Outside Living Concepts is to provide an unprecedented level of customer service that is unmatched in our industry. By designing and building with quality and value, we create spectacular outside living environments that become a natural extension of your home and lifestyle. This “resort like feel” gives years of enjoyment and often is the most used room in the home. We like to call it the “Great Room”, which it really is for families large and small. We are dedicated to designing and building beautiful landscapes and hardscapes that are tailored to your lifestyle, and within your budget. Our talented and courteous crews not only make the construction process fun, but add equity upon completion to one of your largest, personal investments. We are a family owned and operated design build firm in Scottsdale, AZ. Think Green Inc. has been serving the Valley of the Sun since 2000. Whether you need full design build, a landscape revamp or just a sprinkler repair we can help you. We are an award wining design build landscape firm and we are confident that we can help you design your dream yard and then build it for you. Our designers take the time to find out what is important to you, and use their creativity and experience to create functional, aesthetically pleasing design solutions to fit your individual needs. We offer an extremely high level of personal service throughout the design process. Call to set up a consultation with one of our designers to see what we can envision for your project. Scottsdale's premier custom landscape designer views landscape and garden design in the Phoenix, Arizona metro area as a “green art”. It takes specialized knowledge to know what plants and trees work best in the Arizona desert and which varieties respond best to the specific sun exposures within your property. A truly beautiful landscape design incorporates a variety of colors, scents and textures. Arte Verde will design and implement the perfect combination of elements in a way that will appear natural and appeal to your senses. Professional landscaping anchors a house to the site, connects it with the environment and creates a welcoming entrance to a home. A Peoria landscape architect or designer works with living plants as well as building materials to design for future growth and maintenance as well as the present visual appeal. Landscape architecture is very regional, so look for a landscape designer in Peoria, AZ that’s familiar with the local climate and plant types that do well there. Start here to learn more about the landscaping services in Peoria, AZ that will help create your dream garden. The work of this outdoor professional includes most everything surrounding a home's exterior. A landscaping architect can even work with the home architect to choose the right spot for your Peoria, AZ house. From there the Peoria landscaper will develop preliminary concepts for your front or backyard design based on individual needs including the climate and activities that will take place, as well as layouts and planting plans. Landscape architects will also design any structures or outbuildings that will be added to the space. Any grading changes that will be added to the yard are also the responsibility of the architect. This includes any drainage modifications. An engineer can also be responsible for these tasks, but licensed Arizona landscapers are fully capable. Like building architects, they will produce preliminary concept drawings as well as detailed construction documents and planting plans. Three-dimensional renderings and illustrative plans are all supplementary. A Peoria landscaping designer generally will have ecological, aesthetic and technical training, which helps them maximize the potential of your outdoor space. Keeping in mind both style and functionality, garden designers analyze your architecture and yard to produce a plan that may or may not include location and materials for walkways, patios, water features, fences, garden aspects and more. In addition, a landscaper in Peoria, AZ will carefully assess your geographic region to choose plants, trees and flowers that will flourish naturally, as well as address concerns such as drainage, screening and soil conditions. Certain landscape designers only help with the planning portion, while some may deliver the plans and then oversee a hired landscaping contractor. Others — typically following a design-build approach — take care of both the design and all aspects of the landscape architecture and construction. Before you hire an Arizona professional landscaper, consider the scope and emphasis of your outdoor project. Landscape architects, who typically hold advanced degrees in their field, are trained to develop comprehensive structural plans that include plants, hardscaping, water use, drainage and more. Landscape designers typically specialize in the aesthetic and horticultural, rather than structural, side of yard and garden planning. They might or might not have advanced training. Even within their fields, a garden designer may specialize in hardscape- or vegetation-focused designs. In some cases you might need to hire additional help to get the outdoor space you want. Here are some related professionals and vendors to complement the work of landscape architects & landscape designers: Landscape Contractors, Garden & Landscape Supplies, Tree Services, Gardeners, Lawn Care & Sprinklers, Decks, Patios & Outdoor Enclosures. Find a Peoria landscape architect on Houzz. Narrow your search in the Professionals section of the website to Peoria, AZ landscape architects and designers. You can also look through Peoria, AZ photos to find a space you like, then contact the professional who posted the photo.